If you think all enlisted jobs in the Air Force are just about fixing planes or programming satellites in outer space -- leaving the "grunt" work to the Army and Marines -- think again. Air Force Pararescue Specialists, also known as PJs, hold an elite position not only in the Air Force but in the special forces community at large. With exhaustive training in combat tactics, rescue and extraction, and emergency medicine, PJs are charged with the motto "That others may live," reflecting their commitment to risk life and limb behind enemy lines whenever a downed flight crew, or any servicemember, or ally, for that matter, needs rescuing. Prospective pararescue airmen must be male US citizens under the age of 28 and achieve a general technical score of at least 44 on the Armed Services Vocational Aptitude Battery (ASVAB). But that's just the beginning. (If you're older and trying to join Pararescue with prior military service under your belt, you can join so long as the difference between your actual age and the years you served tallies up to less than 28.) As Special Forces members serving on sensitive rescue missions, pararescue members must also be able to qualify for a secret security clearance. Following about two months in Air Force basic training at Lackland Air Force Base (AFB) Texas, new recruits who've made the initial cut for Pararescue still have a long road ahead of them: The Air Force allows two years to prepare their special forces troops for actual duty (taking into account not only training days, but off-duty, administrative, and travel time.) According to the Air Force Special Operations Command (AFSOC) website, the training pipeline is composed of eight different schools. It all begins with a nine-week Indoctrination Course at Lackland that seems like a combination of try-outs and a second boot camp, combining plenty of physically-punishing workouts with foundational basics like dive physics, cardiopulmonary resuscitation, weapons qualifications, PJ history, and leadership reaction course. Those that survive catch a flight to Georgia to attend Fort Benning's Army Airborne School, a three-week joint-service course for parachuting basics. If falling isn't your biggest fear, try drowning: next up are six weeks in Panama City, FL at the Air Force Combat Diver School and a day at Pensacola's Navy Underwater Egress training (where they teach you to escape from a drowning aircraft.) 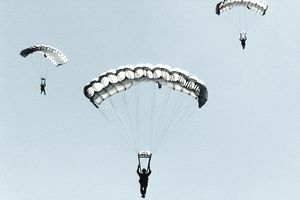 Further torture awaits at the two-week basic survival school at Fairchild AFB and five more weeks of free-fall parachuting at North Carolina Army outpost Fort Bragg. Now, a little creative resume-writing could go a long way to convincing civilian employers that all of these totally Chuck Norris-like skills would be an asset to the company. (Just think of all the cash they'd save by having you run all of the "team-building" retreats.) But pararescue training also offers a real all-expenses-paid education that translates immediately to opportunity once you leave the service: five-and-a-half months of medical training at Kirtland AFB, New Mexico, that results in nationally-recognized certification as a Paramedic. That's a step or two ahead of most entry-level Army medics or Navy corpsmen, who start out as basic emergency medical technicians if they're lucky. The long road concludes at Kirtland with the six-month Pararescue Recovery Specialist Course, which brings all previous training to bear on the core mission of rescuing personnel downed behind enemy lines: it's there that PJs finally become experts at extrication basics, field tactics, mountaineering, combat tactics, advanced parachuting, and helicopter insertion/extraction, according to the AFSOC training pipeline.